I loved burlap WAY before it became popular. Many years ago (and I mean many), I used it for sewing and craft projects. Back in the day, (this would be the late 70's) we could go into a local feed store and grab the big old burlap bags at no cost. One Halloween, I repurposed a couple of burlap bags and fashioned myself a cave woman costume for a college Halloween party. One bag was used to cut a one strap shift (dress) which I wore over a brown turtleneck and with brown tights because it was a cold night. I used additional burlap to make shoe covers that laced up with rawhide shoelaces. I covered a baseball bat (aka my club) with some more burlap and laced the bottom part of the handle with twine and rawhide. I blackened a couple of my teeth, teased my hair, added some dirty spots to my face and I was quite the prehistoric catch! 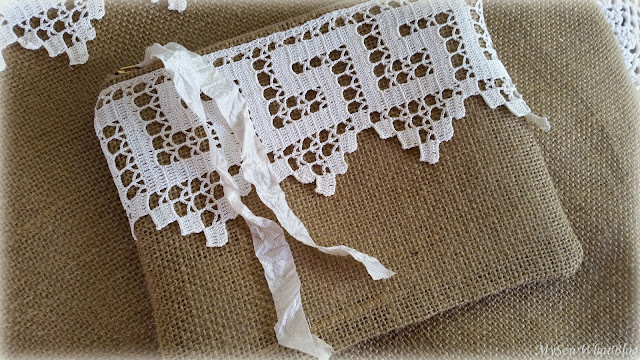 It's been a love affair with burlap ever since! 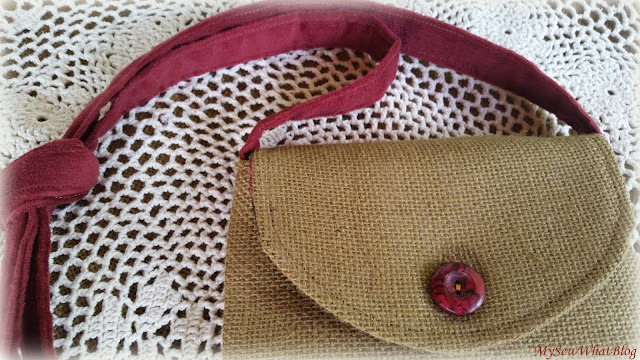 Burlap is such a durable, functional fabric and I like to keep a couple colors on hand. It has become very popular in home decor and fashion accessories and I love the different looks that can be created with it, from rustic to casual and even elegant. This bag went together easily. 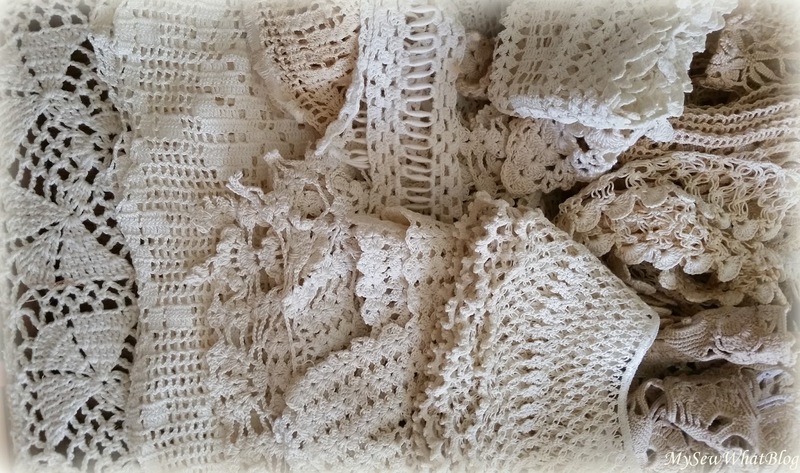 The burlap is a deeper, almost golden brown than the usual, natural color. 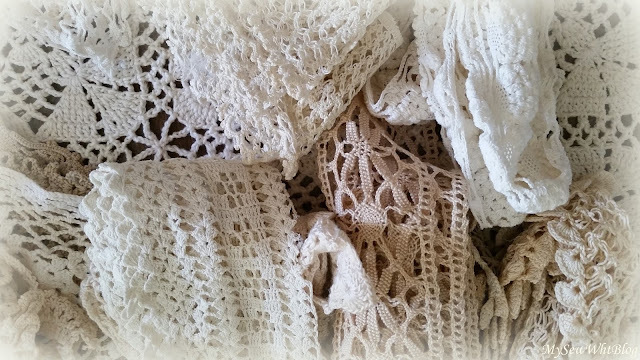 I used some vintage lace edging that I picked up on a fairly recent junkin trip. 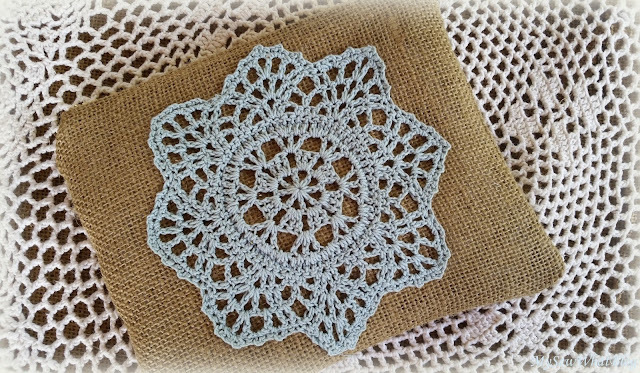 It was in a zip loc bag full of beautiful crocheted and tatted lace and edgings! Just look at it! Anyways, I had just enough of this pretty edging to go around the top of this tote and as you probably guessed, I used the remaining few inches on the matching zipper bag. 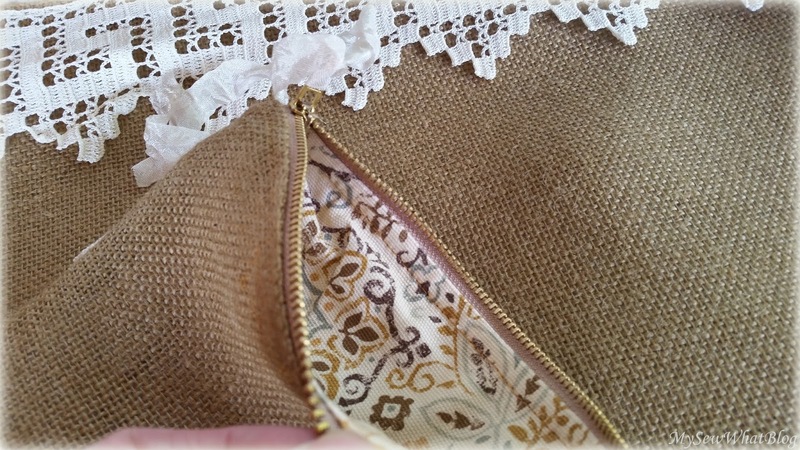 Inside lining and divided pocket. 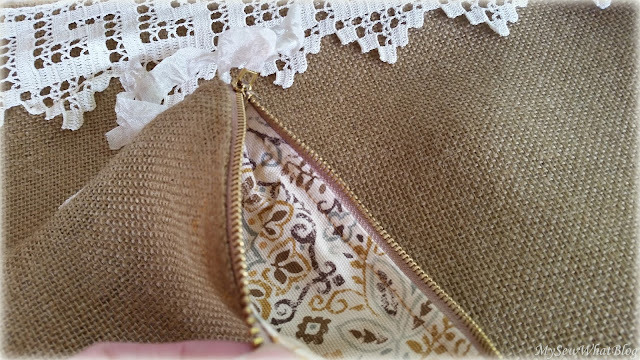 Matching lining in zipper bag and metal zipper. 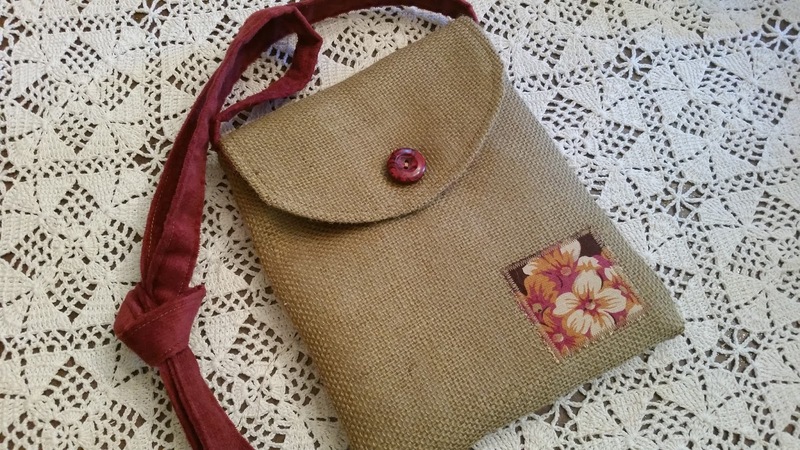 The bag below is one I stitched up to match a tote I made some time ago. 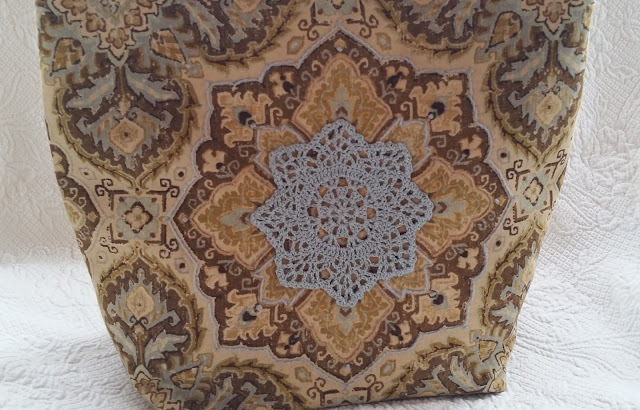 I posted this bag in an earlier post. I used the same fabric on the inside lining of the zipper bag. Then a couple nights ago, I sat down and constructed a simple shoulder strap bag pattern in several sizes. I stitched up the first one night before last. It measures about 10" x 11" if I remember correctly. I love it! 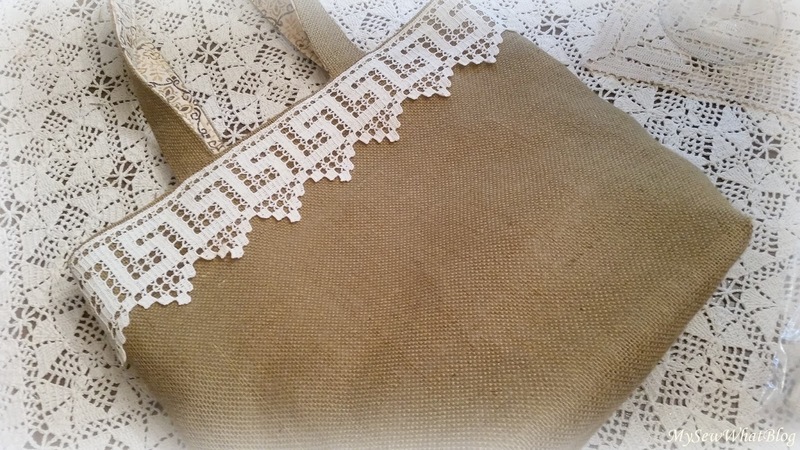 This particular size is perfect to take on a junkin trip, to yard sales or craft fairs--when you don't want to carry much in because you plan on carrying lots out....you know what I mean. I like hands free shopping and only bring necessities with me.....like cash, checkbook, and my credit card! This will easily fit all of that plus your wallet, phone, etc. The long strap is constructed from fine wale corduroy. It can be tied in a knot and carried as a handbag. 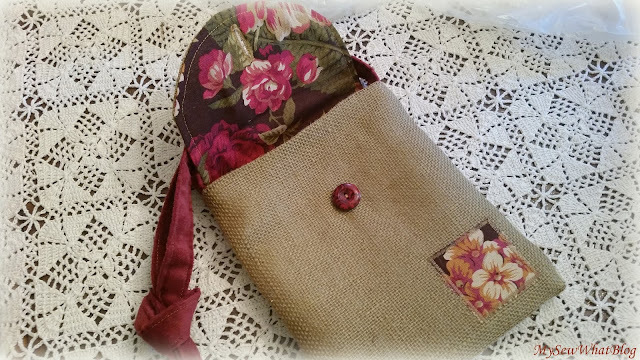 The lining fabric is a beautiful bold floral and I wanted to add a piece of it to add a little color and interest to the outside of the bag without taking away from it's simplicity. 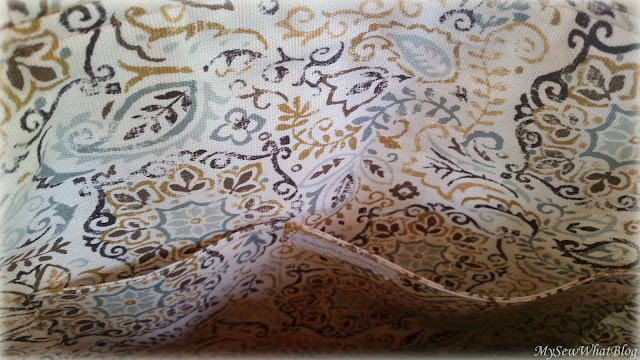 Here is some of that beautiful lining I told you about. The colors are rich and vibrant. I just happened to have a button the exact color! Good thing I practiced using the button hole foot a few weeks back! My sewing machine needs to be serviced and is presently sitting in the trunk of my car so a couple of weeks ago I bought a Heavy Duty Singer to have on hand for those times when my other machine is not in service. 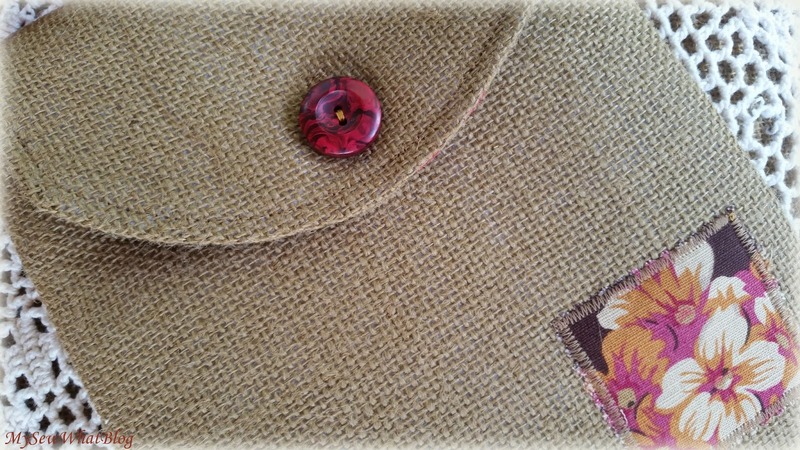 I used my new machine to sew this bag and I am not in love with its plastic button hole attachment. I can't wait to get my other machine fixed! The button hole was easy enough to stitch but my button did not want to sit properly in the attachment because it was too thick. This bag has an inside pocket made from the red corduroy. 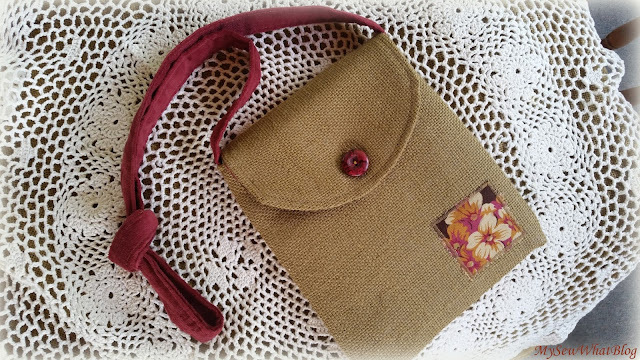 The little patch is stitched on with a zig zag stitch which adds to the casual look of the bag. 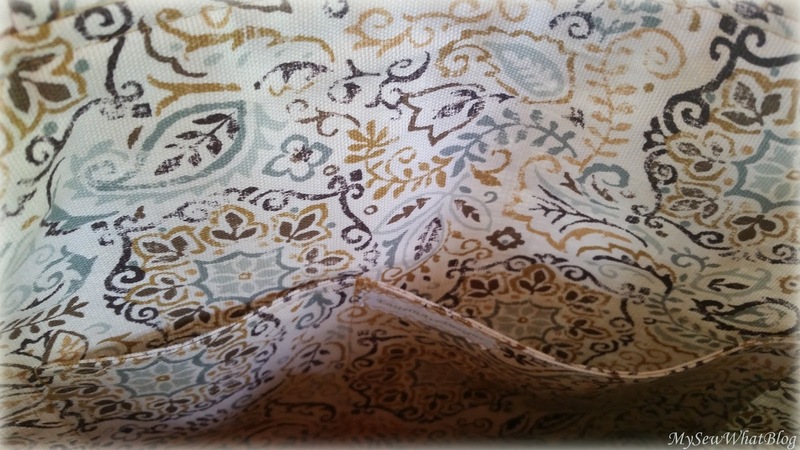 Mixing fabric textures is fun to experiment with and in this case, the burlap, corduroy and decorator fabric all compliment each other nicely. 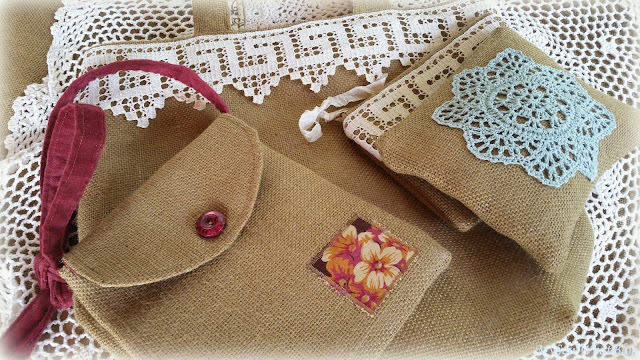 Here's my pile of burlap bags! I've got other projects in progress too! 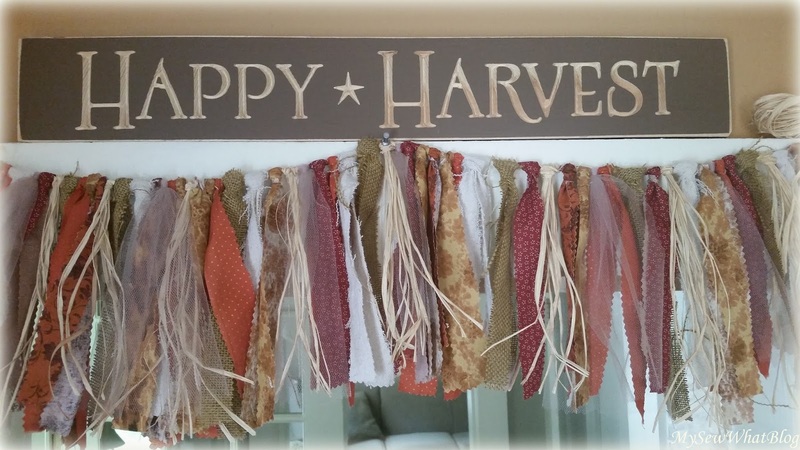 I am hoping to get some more fall decorations made too! but while I'm here I will share one last project that used a bit of burlap. 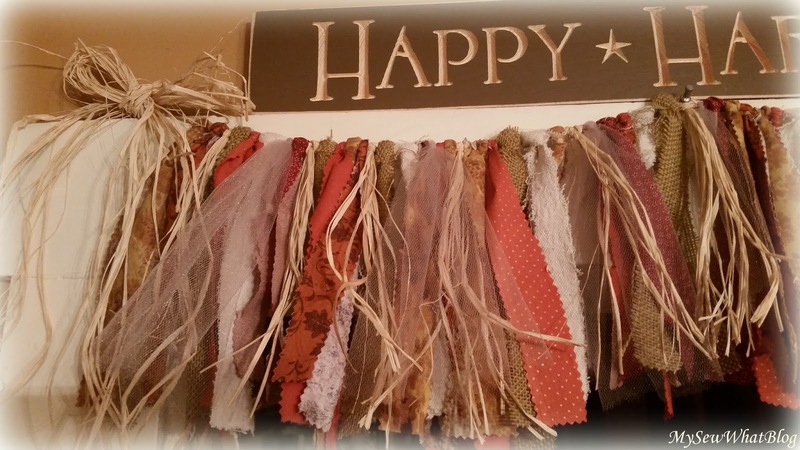 I made a shabby garland with some fall colored cottons, painter's drop cloth, burlap, raffia and tulle. 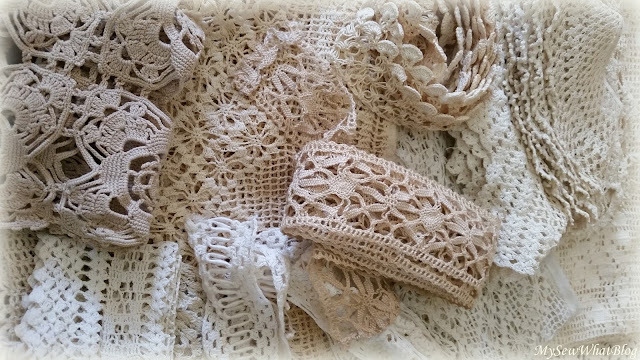 I made raffia bows for each end but it was tough getting it all in one photo.....and the lighting was bad. I am making one more for the other doorway in the room. I was really hoping to hang some over my windows too but I don't think I will have time to make three more! Well that's a wrap for now! More later! Prayers for all affected by the hurricanes.